I attended the World Gourmet Summit (2013) awards ceremony recently, and witnessed the crowning of Waku Ghin as VISMARK Asian Restaurant Of The Year. Waku Ghin was also ranked 11th on the coveted ‘World’s 50 Best Restaurants’ 2013 list. Champagne popping and celebrations aside, the accolades left me puzzled because my virgin experience at Waku Ghin lacked Tetsuya’s midas touch. Waku Ghin is the brain-child of Tetsuya Wakuda, who opened the branch in Singapore following the success of his eponymous restaurant Tetsuya’s in Sydney. Tetusya is touted as one of Australia’s finest chefs, and appeared as the leading judge in the final episode of Junior Master Chef (Australia, Season 2). 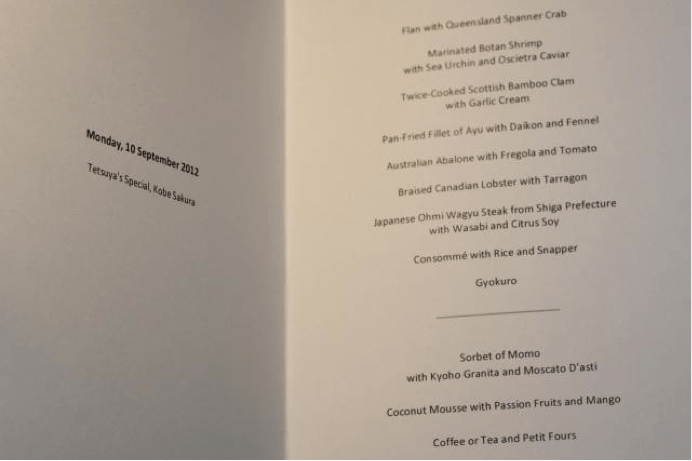 While due respect is given to Tetsuya’s achievements, the hits of my Waku Ghin experience were marred by a couple of misses, not something one would expect from the celebrated degustation menu. 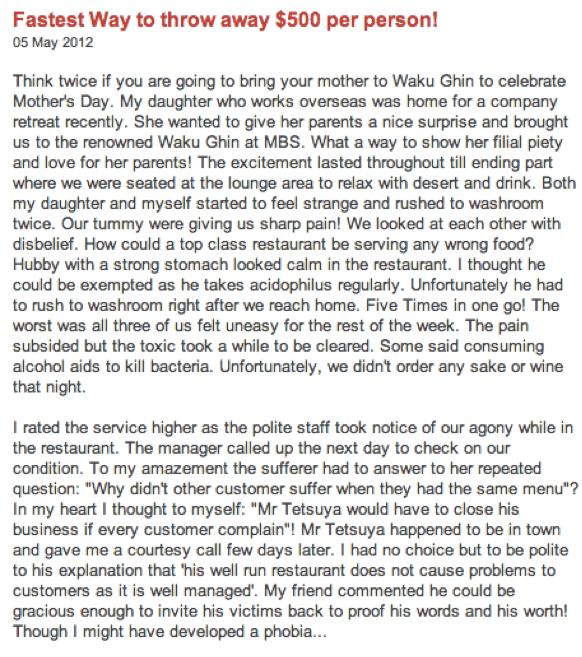 That said, let me preface this post by saying that my tasting notes for Waku Ghin were stuck in my in-tray for awhile now and can only represent the state of Waku Ghin on 10 September 2012. Before delving into the analysis of the food, I shall first set the scene by describing the luxe setting of Waku Ghin, an austere space flanked by contrasting panels of mother of pearl, cold steel and wood. Overlooking the Singapore skyline, it augurs a decadent Omasake experience. Reservations are a must as Waku Ghin can only hold up to 25 guests at one time – this limit is effected to ensure an impeccable dining experience with a 1 waitstaff-to-2 guest ratio. Our party of 6 was led to a cosy enclosure and seated in front of a teppan (‘metal griddle‘). The 10 course degustation menu was kickstarted by Flan with Queensland Spanner Crab presented in a quaint porcelain cup. It was forgettable to say the least, as the silky flan though well-prepared was more of a stomach filler than a taste bud tantalizer. Next up, was the restaurant’s signature dish, Marinated Botan Shrimp with Sea Urchin and Oscietra Caviar – easily my favourite of the night. 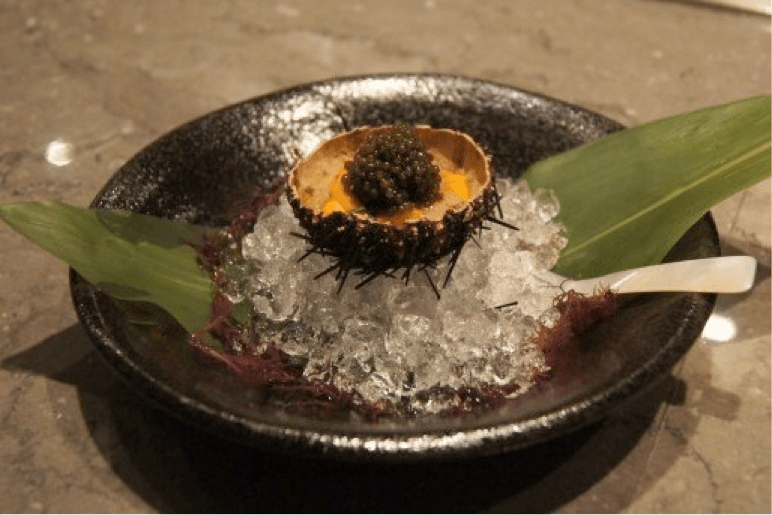 The presentation was exquisite with briny lobes of mustard sea urchin (‘uni‘) complementing the silky, silver Botan shrimp (‘Botan ebi‘) and topped with a dollop of creamy oscietra caviar placed over a bowl of shaved ice. To top it all off, the trio was to be savoured with a mother of pearl spoon, said to enhance the taste of the dish. Botan ebi prized for its texture, is rare as it can only be found at the depths of 300-500 metres along Hokkaido’s shores. It is never boiled and Botan ebi is so delicate that it sits in shell till preparation time. The uni, sourced from Hokkaido as well, is gently washed to remove any hint of bitterness before it is placed back into its oblate, thorny exterior. Taste wise, the sharp, salty tanginess of the finest oscietra caviar from Beluga, punctuated the otherwise sweet, succulent flavours of the Botan ebi and uni mix, which left me satisfied right down to the last morsel. This dish lingered on my palate, but longer in my mind. Third on the indulgent list, is the Twice-Cooked Scottish Bamboo Clam with Garlic Cream. I have a soft spot for bamboo clams, and this did not disappoint. The bamboo clams were first blanched then sauteed, and its flavourful freshness was teased out by the garlic cream emulsion, parsley oil, croutons and slivers of chilli. This was followed by the lackluster Pan-fried Fillet of Ayu with Daikon and Fennel which failed to impress as the Ayu’s (‘Japanese sweetfish’) flesh was dry, even though its skin was fried to a crisp perfection. Following which, we had the plump Australian Abalone with Fregola and Tomato, dexterously dissected into quarters by our chef over the teppan. The succulent, chewy abalone was cleanly paired with the fregola, cherry tomatoes, rocket and aioli which lent a hint of Italian flavours. It seemed to me that the Italian touch was a tad too subdued and took a backseat as the freshness of the voluptuous abalone shone through. Waku Ghin prides itself on using the freshest produce. 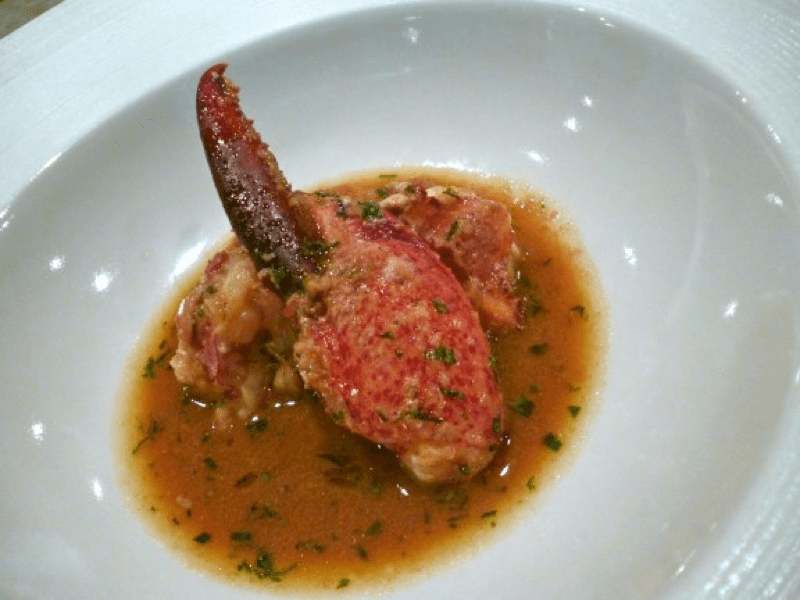 The next dish, Braised Canadian Lobster with Tarragon was testament to that. The lobster claw was meticulously pre-peeled, garnished with garlic and shallots, and sauteed in a creamy seafood broth right before our eyes – a culinary visual feast. Upon my first bite, the juiciness of the rosy, rich lobster oozed into my mouth and it certainly tasted as good as it looked. I read rave reviews about Ohmi wagyu steak that melted in mouths and how it is hailed it as the ‘Rolls Royce’ of beef. The preceding high was followed by a let-down of the night’s rendition of Japanese Ohmi Wagyu Steak from Shiga Perfecture with Wasabi and Citrus Soy. The marbled beef was too tough and rubbery for my liking despite it being medium-rare, and the wasabi and citrus soy combination though spritely, was not worth a special mention. I could easily enumerate steak places where I had a more satisfying experience. The full-bodied menu came to a sudden halt with the Consommé with Rice and Snapper. Personally, I was not awed by this mediocre dish which to me, was simply rice and snapper simmered in boiling stock which had been ‘clarified‘ and garnished with some zesty yuzu. I understand the consommé was made bland on purpose, but I could not see how this dish fit in to the pace of the degustation menu, as it seemed like an impromptu u-turn. Rounding off the heavier segment, is a preparation of one of the world’s finest teas, Gyokuro,also known as ‘Emperor’s Tea‘. The Gyokuro leaves brewed at Waku Ghin are superior to those served at other high-end Japanese restaurants in Singapore as Tetsuya has connections with owners of a Gyokuro farm, and hence he is able to procure the best grade. Although Gyokuro may be a perfect palate cleanser, the overwhelming bitterness was not to my liking. We were ushered to the plush dessert room which overlooked the Fullerton Hotel, a sight to behold. The trio of desserts was pleasant but not mind-blowing. First off was the Sorbet of Momo with Kyoho Granita and Moscato D’asti. Japanese grape granitas was drizzled with sweet, white wine – while this was refreshing, it was far from spectacular. The Coconut Mousse with Passion Fruits and Mango was a creamy treat paired with fresh fruits. It placated my sweet-tooth but was otherwise pretty average. 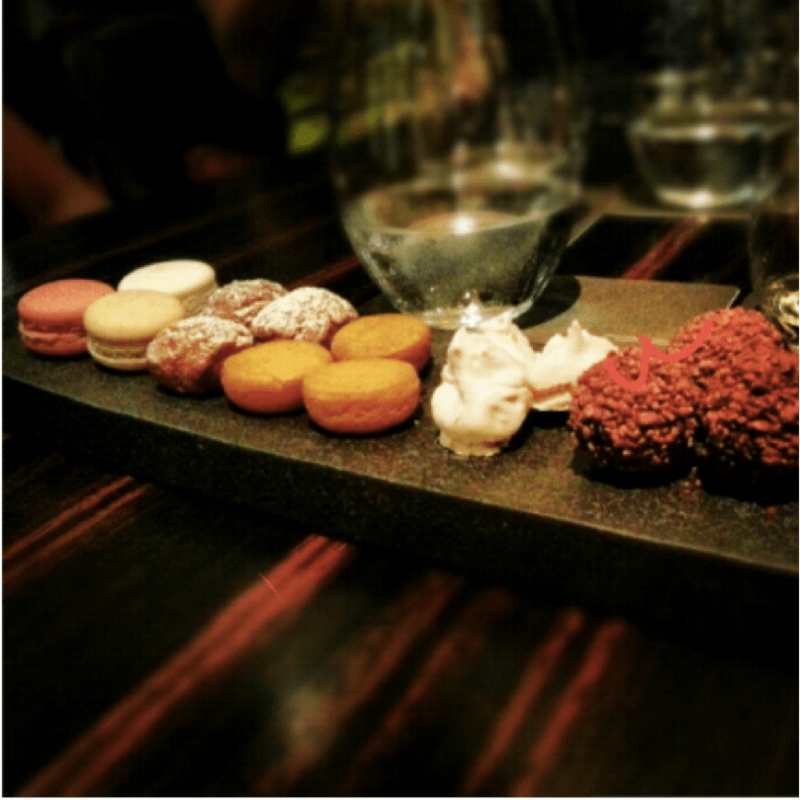 The night was concluded with Coffee/Tea and Petit Fours which consisted of macarons, madelines, truffle and meringue. Decent, but uninspired. Sad to say, the menu did not sit well with my stomach and I had to make a dash for the washroom the moment I returned home. My dining companions had no complaints, so I surmised that it was probably a contained, individual reaction. However, upon a cursory web search, I felt less alone judging by a handful of reviews by patrons who had a similar experience. The first review is rather harsh, but I share the sentiment that having to purge the pricey exotic catches in one sitting was not the most pleasant experience. 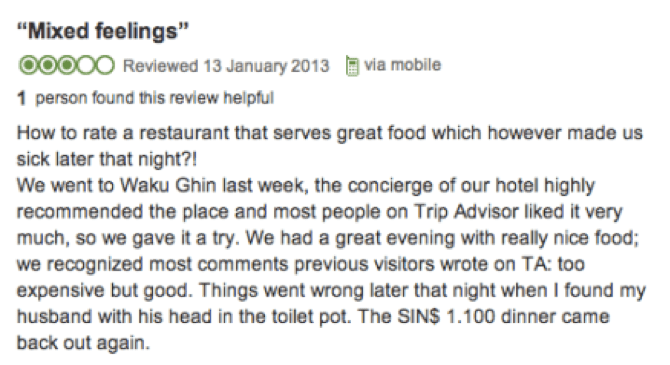 Judging by the numerous awards it has bagged, Waku Ghin has won over many food connoisseurs but sadly, not me. Waku Ghin lacks consistency, one of the pre-requisites of a Michelin star. Tetsuya’s magic was hardly present during my experience, it missed the mark a couple of times and felt more like a high-end Teppanyaki dining experience. The degustation menu is priced at SGD 400++, still water as an accompaniment costs an additional SGD 20 ++. This review was done independently, Popspoken has no affiliations with Waku Ghin or related companies. Prev post Kevin Lester’s Album Is Getting Some Buzz In The States Next post An Incredible evening with Irish rockers The Script!